The mission of the foundation is "to promote the understanding and appreciation of art, architecture, and other manifestations of visual culture, primarily of the modern and contemporary periods, and to collect, conserve, and study" modern and contemporary art. The Foundation seeks, in its constituent museums, to unite distinguished architecture and artworks. The foundation's first permanent museum, the Solomon R. Guggenheim Museum, is housed in a modern spiral building designed by Frank Lloyd Wright, and the Guggenheim Bilbao was designed by Frank Gehry. Both of these innovative designs received wide press and critical attention. The Peggy Guggenheim Collection is housed in an 18th-century Italian palace, the Palazzo Venier dei Leoni, on the Grand Canal. The permanent collection of the foundation is based primarily on nine private collections: Solomon R. Guggenheim's collection of non-objective paintings; Karl Nierendorf's collection of German expressionism and early abstract expressionism; Katherine S. Dreier's gift of paintings and sculptures; Peggy Guggenheim's collection, concentrating on abstraction and surrealism; Justin K. and Hilde Thannhauser's collection of impressionist, post-impressionist, and early modern masterpieces; part of Hilla von Rebay's collection; Giuseppe Panza di Biumo's holdings of American minimalist, post-minimalist, environmental and conceptual art of the 1960s and 1970s; a collection of photographs and mixed media from the Robert Mapplethorpe Foundation; and the Bohen Foundation's collection of film, video, photography and new media. The foundation's collections have expanded greatly through eight decades and include every major movement of 20th- and 21st-century art. Its directors and curators have attempted to form a single collection that is not encyclopedic, but rather based on their unique visions. The collection has grown in scope to include new media and performance art, and the foundation has entered into collaborations with YouTube and BMW. Solomon R. Guggenheim, a member of a wealthy mining family, began collecting works of the old masters in the 1890s. He retired from his business in 1919 to devote more time to art collecting. In 1926, at age 66, he met artist Hilla von Rebay, who was commissioned by Guggenheim's wife, Irene Rothschild, to paint his portrait. Rebay introduced him to European avant-garde art, in particular abstract art that she felt had a spiritual and utopian aspect (non-objective art). Guggenheim completely changed his collecting strategy. In 1930, the two visited Wassily Kandinsky's studio in Dessau, Germany, and Guggenheim began to purchase Kandinsky's work. The same year, Guggenheim began to display the collection to the public at his apartment in the Plaza Hotel in New York City. Guggenheim's purchases continued with the works of Rudolf Bauer, Fernand Léger, Robert Delaunay, and great artists who were not of the non-objective school, such as Marc Chagall, Jean Metzinger, Albert Gleizes, Pablo Picasso and László Moholy-Nagy. In 1937, Guggenheim established the Solomon R. Guggenheim Foundation to foster the appreciation of modern art. The foundation's first venue for the display of art was called the "Museum of Non-Objective Painting". It opened in 1939 under the direction of Rebay, its first curator, in a former automobile showroom at East 54th Street in midtown Manhattan. This moved, in 1947, to another rented space at 1071 Fifth Avenue. Under Rebay's guidance, Guggenheim sought to include in the collection the most important examples of non-objective art available at the time, such as Kandinsky's Composition 8 (1923), Léger's Contrast of Forms (1913) and Delaunay's Simultaneous Windows (2nd Motif, 1st Part) (1912). By the early 1940s, the foundation had accumulated such a large collection of avant-garde paintings that the need for a permanent building to house the art collection had become apparent. In 1943, Guggenheim and Rebay commissioned architect Frank Lloyd Wright to design the museum building. Rebay conceived of the space as a "temple of the spirit" that would facilitate a new way of looking at the modern pieces in the collection. In 1948, the collection was greatly expanded through the purchase of art dealer Karl Nierendorf's estate of some 730 objects, notably German expressionist paintings. By that time, the foundation's collection included a broad spectrum of expressionist and surrealist works, including paintings by Paul Klee, Oskar Kokoschka and Joan Miró. Guggenheim died in 1949, and the museum was renamed the Solomon R. Guggenheim Museum in 1952. The foundation expanded its display activities with a series of traveling exhibitions. After Guggenheim's death, members of the Guggenheim family who sat on the foundation's board of directors had personal and philosophical differences with Rebay, and in 1952 she resigned as director of the museum. Nevertheless, she left a portion of her personal collection to the foundation in her will, including works by Kandinsky, Klee, Alexander Calder, Gleizes, Piet Mondrian and Kurt Schwitters. In 1953, the foundation's collecting boundaries extended even further under its new director, James Johnson Sweeney. Sweeney rejected Rebay's dismissal of "objective" painting and sculpture, and he soon acquired Constantin Brâncuși's Adam and Eve (1921), followed by works of other modernist sculptors, including Jean Arp, Alexander Calder, Alberto Giacometti and David Smith. Sweeney reached beyond the 20th century to acquire Paul Cézanne's Man with Crossed Arms (c. 1899). In 1953, the foundation received a gift of 28 important works from the Estate of Katherine S. Dreier, a founder of America's first collection to be called a modern art museum, the Société Anonyme. Dreier had been a colleague of Rebay's. The works included Little French Girl (1914–18) by Brâncuși, an untitled still life (1916) by Juan Gris, a bronze sculpture (1919) by Alexander Archipenko and three collages (1919–21) by German Hanoverian Dadaist Schwitters. It also included works by Calder, Marcel Duchamp, El Lissitzky and Mondrian. Among others, Sweeney also acquired the works of Alberto Giacometti, David Hayes, Willem de Kooning and Jackson Pollock. He also established the Guggenheim International Awards in 1956. Sweeney oversaw the last half dozen years of the construction of the museum building, during which time he had an antagonistic relationship with Frank Lloyd Wright, especially regarding the building's lighting issues. The distinctive cylindrical building, wider at the top than the bottom, with a spiral ramp climbing gently from ground level to the skylight at the top, turned out to be Wright's last major work, as the architect died six months before its opening. The building opened in October 1959 to large crowds and instantly polarized architecture critics, though today it is widely praised. Some of the criticism focused on the idea that the building overshadows the artworks displayed inside, and that it is difficult to properly hang paintings in the shallow, windowless, concave exhibition niches that surround the central spiral. Prior to its opening, twenty-one artists signed a letter protesting the display of their work in such a space. Upon opening, the museum received a largely favorable response from the public, despite the early misgivings: "overall Wright's design was, and still is, admired for being highly personal and inviting". Thomas M. Messer succeeded Sweeney as director of the museum (but not the foundation) in 1961 and stayed for 27 years, the longest tenure of any of the city's major arts institutions' directors. When Messer took over, the museum's ability to present art at all was still in doubt due to the challenges presented by continuous spiral ramp gallery that is both tilted and has curved walls. Almost immediately, in 1962, he took a risk putting on a large exhibition that combined the Guggenheim's paintings with sculptures on loan from the Hirshhorn Museum. Three-dimensional sculpture, in particular, raised "the problem of installing such a show in a museum bearing so close a resemblance to the circular geography of hell", where any vertical object appears tilted in a "drunken lurch" because the slope of the floor and the curvature of the walls could combine to produce vexing optical illusions. It turned out that the combination could work well in the Guggenheim's space, but, Messer recalled that at the time, "I was scared. I half felt that this would be my last exhibition." Messer had the foresight to prepare by staging a smaller sculpture exhibition the previous year, in which he discovered how to compensate for the space's weird geometry by constructing special plinths at a particular angle, so the pieces were not at a true vertical yet appeared to be so. In the earlier sculpture show, this trick proved impossible for one piece, an Alexander Calder mobile whose wire inevitably hung at a true plumb vertical, "suggesting hallucination" in the disorienting context of the tilted floor. The next year, Messer acquired a private collection from art dealer Justin K. Thannhauser for the foundation's permanent collection. These 73 works include Impressionist, Post-Impressionist and French modern masterpieces, including important works by Paul Gauguin, Édouard Manet, Camille Pissarro, Vincent van Gogh and 32 works by Pablo Picasso. Peggy Guggenheim, Solomon's niece, collected and displayed art beginning in 1938. At Messer's urging, she donated her art collection and home in Venice, the Palazzo Venier dei Leoni, to the foundation in 1976. After her death in 1979, the collection of more than 300 works was re-opened to the public as the Peggy Guggenheim Collection in 1980 by the foundation, which was then under the direction of Peter Lawson-Johnston. It includes early 20th century works of prominent American modernists and Italian futurists. Pieces in the collection embrace Cubism, Surrealism and Abstract expressionism. Some of the notable artists are Picasso, Dalí, Magritte, Brâncuși (including a sculpture from the Bird in Space series), eleven works by Pollock, Braque, Duchamp, Léger, Severini, Picabia, de Chirico, Mondrian, Kandinsky, Miró, Giacometti, Klee, Gorky, Calder, Max Ernst and Peggy Guggenheim's daughter, Pegeen Vail Guggenheim. Thomas Krens, director of the foundation from 1988 to 2008, led a rapid expansion of the foundation's collections. In 1991, he broadened the foundation's holdings by acquiring the Panza Collection. Assembled by Count Giuseppe di Biumo and his wife, Giovanna, the Panza Collection includes examples of Minimalist sculptures by Carl Andre, Dan Flavin and Donald Judd, and Minimalist paintings by Robert Mangold, Brice Marden and Robert Ryman, as well as an array of Post-Minimal, Conceptual, and perceptual art by Robert Morris, Richard Serra, James Turrell, Lawrence Weiner and others, notably American examples of the 1960s and 1970s. In 1992, the Robert Mapplethorpe Foundation gifted 200 of his best photographs to the foundation. The works spanned his entire output, from his early collages, Polaroids, portraits of celebrities, self-portraits, male and female nudes, flowers and statues. It also featured mixed-media constructions and included his well-known 1998 Self-Portrait. The acquisition initiated the foundation's photography exhibition program. Also in 1992, the New York museum building's exhibition and other space was expanded by the addition of an adjoining rectangular tower, taller than the original spiral, and a renovation of the original building. The same year, the foundation opened a small Guggenheim Museum SoHo in the SoHo neighborhood of downtown Manhattan. This space was kept after the main museum was re-opened, but it closed in 2002 due to an economic downturn. To finance these moves, controversially, the foundation sold works by Kandinsky, Chagall and Modigliani to raise $47 million, drawing considerable criticism for trading masters for "trendy" latecomers. In The New York Times, critic Michael Kimmelman wrote that the sales "stretched the accepted rules of deaccessioning further than many American institutions have been willing to do." Krens defended the action as consistent with the museum's principles, including expanding its international collection and building its "postwar collection to the strength of our pre-war holdings" and pointed out that such sales are a regular practice by museums. One of Krens's most significant initiatives was to expand the foundation's international presence. The Guggenheim Museum Bilbao opened in 1997. Designed by Frank Gehry, the titanium, glass and limestone Guggenheim Bilbao is a centerpiece of the revitalization of the Basque city of Bilbao, Spain. The building was greeted with glowing praise from architecture critics. The Basque government funded the construction, while the Foundation purchased the artworks and manages the facility. The museum's permanent collection includes works by modern and contemporary Basque and Spanish artists like Eduardo Chillida, Juan Munoz and Antonio Saura, as well as works from the foundation, and it has organized various exhibitions curated by the Solomon R. Guggenheim Museum in New York. Also in 1997, the foundation opened a small gallery in the Unter den Linden area of Berlin, Germany, as the Deutsche Guggenheim, in cooperation with the Deutsche Bank. The Deutsche Guggenheim had four exhibitions each year, complemented by educational programming, and it annually commissioned one, or occasionally two, new artworks or series by contemporary artists, which were then displayed at the museum in a special exhibition. After 14 years of operation, Deutsche Guggenheim closed at the end of 2012. Under Krens, the foundation mounted some of its most popular exhibitions: "Africa: The Art of a Continent" in 1996; "China: 5,000 Years" in 1998, "Brazil: Body & Soul" in 2001; and "The Aztec Empire" in 2004. It has shown unusual exhibitions on occasion, for example commercial art installations of Giorgio Armani suits and motorcycles. The New Criterion's Hilton Kramer condemned both The Art of the Motorcycle and the retrospective of the work of fashion designer Armani. Others disagreed. A 2009 retrospective of Frank Lloyd Wright at the original building in New York showcased the architect on the 50th anniversary of the opening of the building and was the museum's most popular exhibit since it began keeping such attendance records in 1992. In 2001, the foundation opened two new museums in Las Vegas, Guggenheim Las Vegas and Guggenheim Hermitage Museum, both designed by architect Rem Koolhaas. The museums showcased highlights of the collections, respectively, of the foundation and the Hermitage Museum in Saint Petersburg, Russia. The first and larger of the two hosted one exhibition: "The Art of the Motorcycle", before closing in 2003. The latter, held ten exhibitions of masterworks by leading artists from the last six centuries, including Van Eyck, Titian, Velázquez, Van Gogh, Picasso, Pollock and Lichtenstein. The Guggenheim Hermitage Museum closed in 2008. In 2001 the foundation also established the Sackler Center for Arts Education on the campus of the original New York building. The same year, the foundation received a gift of the large collection of the Bohen Foundation, which, for two decades, commissioned new works of art with an emphasis on film, video, photography and new media. Artists included in the collection are Pierre Huyghe, Sophie Calle and Jac Leirner. The foundation planned for a large Guggenheim museum on the waterfront in lower Manhattan, and it engaged Frank Gehry as the architect. His essentially complete designs for the building were showcased in 2001 at the Fifth Avenue museum, but these plans were disrupted by the economic downturn of the early 2000s and the September 11, 2001 attacks, which prompted reconsideration of any plans in lower Manhattan. Other projects in Rio de Janeiro, Vilnius, Salzburg, Guadalajara and Taichung were also considered but not completed. On January 19, 2005, the philanthropist Peter B. Lewis resigned from his position as chairman of the foundation, expressing his opposition to Krens' plans for further global expansion of the Guggenheim museums. Lewis had been the largest donor in the history of the Guggenheim. Tensions continued, however, and on February 27, 2008, Krens resigned from his position in the foundation. He has remained, however, as an advisor for international affairs. Over his two decades at the head of the foundation, Krens was criticized not only for the deaccessioning of older works of the museum but for both his businesslike style and perceived populism and commercialization. One writer commented, "Krens has been both praised and vilified for turning what was once a small New York institution into a worldwide brand, creating the first truly multinational arts institution. ... Krens transformed the Guggenheim into one of the best-known brand name in the arts." Richard Armstrong became the fifth director of the foundation on November 4, 2008. 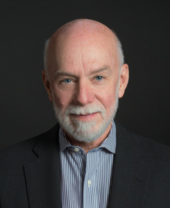 He had been director of the Carnegie Museum of Art in Pittsburgh, Pennsylvania for 12 years, where he had also served as chief curator and curator of contemporary art. In addition to its permanent collections, which continue to grow, the foundation administers loan exhibitions and co-organizes exhibitions with other museums to foster public outreach. In 2006, Abu Dhabi, the capital of the United Arab Emirates, announced an agreement with the Guggenheim Foundation to build a new museum, "Guggenheim Abu Dhabi". Gehry designed the structure, which will, if completed, be the foundation's largest by far. It has begun construction on the northwest tip of Saadiyat Island, along with a performing arts center, the Zayed National Museum and a branch of the Louvre. The museum is expected to "create an exhibition space intended to turn this once-sleepy desert city along the Persian Gulf into an international arts capital and tourist destination." The completion date has been pushed back repeatedly, and the museum is now expected to open in 2017 at the earliest. The museum is expected to house modern and contemporary collections that will focus on Middle-Eastern contemporary art and to display special exhibitions from the foundation's main collection. In 2011, the city of Helsinki, Finland, commissioned the foundation to study the feasibility of constructing a museum there. The feasibility study recommended building the museum in Helsinki's South Harbor. In 2012, the proposal was rejected by the city board "over concerns about the cost and a proposed merger with the Helsinki Art Museum". In 2013, the foundation made a revised proposal that provideed that the project's architect would be chosen through an international competition. The proposal anticipated that the Guggenheim's licensing fee would be funded by private sources, with decreased operating costs and increased revenues; one journalist called the Foundation's estimates "speculative at best". In 2014, the city council approved an international architecture competition to solicit designs for the museum, and the following year, a design was chosen. In 2016 the Helsinki city council voted to reject the plan. The foundation has long sought, in its constituent museums, to unite its artworks with distinguished architecture. In 1943, Hilla von Rebay and Solomon R. Guggenheim commissioned Frank Lloyd Wright to build the foundation's first permanent museum. Rebay wrote to Wright that "each of these great masterpieces should be organized into space, and only you ... would test the possibilities to do so. … I want a temple of spirit, a monument!" The resultant achievement, the Solomon R. Guggenheim Museum, in New York City, testifies not only to Wright's architectural genius, but also to the adventurous spirit that characterized its founders. The critic Paul Goldberger later wrote that, before Wright's modernist building, "there were only two common models for museum design: Beaux-arts Palace ... and the International Style Pavilion." Goldberger thought the building a catalyst for change, making it "socially and culturally acceptable for an architect to design a highly expressive, intensely personal museum. In this sense almost every museum of our time is a child of the Guggenheim." Before settling on the present site for the Solomon R. Guggenheim Museum on Fifth Avenue between 88th and 89th Streets, Wright, Rebay and Guggenheim considered numerous locations in Manhattan, as well as in the Riverdale section of the Bronx, overlooking the Hudson River. Guggenheim felt that the site's proximity to Central Park was important; the park afforded relief from the noise, congestion and concrete of the city. Nature also provided the museum with inspiration. The building embodies Wright's attempts "to render the inherent plasticity of organic forms in architecture." The Guggenheim was to be the only museum designed by Wright. The city location required Wright to design the building in a vertical rather than a horizontal form, far different from his earlier, rural works. Wright's original concept was called an inverted "ziggurat", because it resembled the steep steps on the ziggurats built in ancient Mesopotamia. His design dispensed with the conventional approach to museum layout, in which visitors are led through a series of interconnected rooms and forced to retrace their steps when exiting. Wright's plan was for the museum guests to ride to the top of the building by elevator, to descend at a leisurely pace along the gentle slope of the continuous ramp, and to view the atrium of the building as the last work of art. The open rotunda afforded viewers the unique possibility of seeing several bays of work on different levels simultaneously and even to interact with guests on other levels. The spiral design recalled a nautilus shell, with continuous spaces flowing freely one into another. Even as it embraced nature, Wright's design also expresses his take on modernist architecture's rigid geometry. Wright ascribed a symbolic meaning to the building's shapes. He explained, "these geometric forms suggest certain human ideas, moods, sentiments – as for instance: the circle, infinity; the triangle, structural unity; the spiral, organic progress; the square, integrity." Forms echo one another throughout: oval-shaped columns, for example, reiterate the geometry of the fountain. Circularity is the leitmotif, from the rotunda to the inlaid design of the terrazzo floors. Wright's vision took 16 years to be fulfilled. Set in sharp contrast to typically rectangular Manhattan buildings that surround it, the Solomon R. Guggenheim Museum building opened in October 1959. Even before it opened, the design polarized architecture critics. Some believed that the building would overshadow the museum's artworks. "On the contrary", wrote the architect, the design makes "the building and the painting an uninterrupted, beautiful symphony such as never existed in the World of Art before." Other critics, and many artists, felt that it is awkward to properly hang paintings in the shallow, windowless, concave exhibition niches that surround the central spiral. The building, nevertheless, became widely praised and inspired many other architects. The building's surface was made out of concrete to reduce the cost, inferior to the stone finish that Wright had wanted. The small rotunda (or "Monitor building", as Wright called it) next to the large rotunda was intended to house apartments for Rebay and Guggenheim but instead became offices and storage space. In 1965, the second floor of the Monitor building was renovated to display the museum's growing permanent collection, and with the restoration of the museum in 1990–92, it was turned over entirely to exhibition space and christened the Thannhauser Building, in honor of one of the most important bequests to the museum. Wright's original plan for an adjoining tower, artists' studios and apartments went unrealized, largely for financial reasons. However, as part of the restoration, architects Gwathmey Siegel and Associates analyzed Wright's original sketches to design the rectangular 10-story limestone tower, that stands behind, and taller than, the original spiral building (replacing a much smaller structure), which has four additional exhibition galleries with flat walls that are "more appropriate for the display of art." Also in the original construction, the main gallery skylight had been covered, which compromised Wight's carefully articulated lighting effects. This changed in 1992 when the skylight was restored to its original design. Funding for the alterations was raised partly through the controversial sale of masterworks by the foundation in 1991. In 2001, the museum opened the Sackler Center for Arts Education to the public, which was another part of Wright's original design for the building, through a gift of the Mortimer D. Sackler family. Located just below the large rotunda, this 8,200-square-foot education facility provides classes and lectures about the visual and performing arts and opportunities to interact with the museum's collections and special exhibitions through its labs, exhibition spaces, conference rooms and the Peter B. Lewis Theater. Between September 2005 and July 2008, the Guggenheim Museum underwent a significant exterior restoration to repair cracks and modernize systems and exterior details. Artist Jenny Holzer painted a tribute, For the Guggenheim, in honor of Peter B. Lewis, a major benefactor in the restoration project. The museum was registered as a National Historic Landmark on October 6, 2008. Peggy Guggenheim purchased the Palazzo Venier dei Leoni in 1948 to house and display her collection to the public, and she resided there for thirty years. Although sometimes mistaken for a modern building, it is an 18th-century palace designed by the Venetian architect Lorenzo Boschetti. The building was unfinished and has an unusually low elevation on the Grand Canal. The museum's website describes its "long low façade, made of Istrian stone and set off against the trees in the garden behind that soften its lines, forms a welcome "caesura" in the stately march of Grand Canal palaces from the Accademia to the Salute." The Foundation took control of the building in 1979 following Guggenheim's death and took steps to expand gallery space. By 1985, "all of the rooms on the main floor had been converted into galleries ... the white Istrian stone facade and the unique canal terrace had been restored", and a protruding arcade wing, called the barchessa, had been rebuilt by architect Giorgio Bellavitis. Since 1985, the museum has been open year-round. In 1993, the foundation converted apartments adjacent to the museum into a garden annex, a shop and more galleries. In 1995, the Nasher Sculpture Garden was completed, Since 1993, the museum has doubled in size, from 2,000 to 4,000 square meters. and it was renovated in 2012. 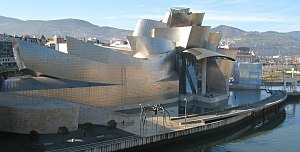 In 1991, the Basque government suggested to the foundation that it would fund a Guggenheim museum to be built in Bilbao. The foundation selected Frank Gehry as the architect, and its director, Thomas Krens, encouraged him to design something daring and innovative. The curves on the exterior of the building were intended to appear random; the architect said that "the randomness of the curves are designed to catch the light". The interior "is designed around a large, light-filled atrium with views of Bilbao's estuary and the surrounding hills of the Basque country." When the Guggenheim Museum Bilbao opened to the public in 1997, it was immediately hailed as one of the world's most spectacular buildings, a masterpiece of the 20th century. Architect Philip Johnson described it as "the greatest building of our time", while critic Calvin Tomkins, in The New Yorker, characterized it as "a fantastic dream ship of undulating form in a cloak of titanium", its brilliantly reflective panels also reminiscent of fish scales. Herbert Muschamp praised its "mercurial brilliance" in The New York Times Magazine. The Independent calls the museum "an astonishing architectural feat". The museum is seamlessly integrated into the urban context, unfolding its interconnecting shapes of stone, glass and titanium on a 32,500-square-meter site along the Nervión River in the old industrial heart of the city; while modest from street level, it is most impressive when viewed from the river. Eleven thousand square meters of exhibition space are distributed over nineteen galleries, ten of which follow a classic orthogonal plan that can be identified from the exterior by their stone finishes. The remaining nine galleries are irregularly shaped and can be identified from the outside by their swirling organic forms and titanium cladding. The largest gallery measures 30 meters wide and 130 meters long. Since 2005, it has housed Richard Serra's monumental installation "The Matter of Time". Deutsche Guggenheim, in Berlin, opened one month after the Guggenheim Museum Bilbao, in 1997. Designed by American architect Richard Gluckman in a minimalist style, the modest Berlin gallery occupied a corner of the ground floor of the sandstone Deutsche Bank building, in the Unter der Linden boulevard, constructed in 1920. It closed in 2013. The museum in Abu Dhabi is planned to be the foundation's largest facility by far. Gehry's design features exhibition galleries, education and research space, a conservation laboratory, a center for contemporary Arab, Islamic and Middle Eastern culture, and a center for "art and technology". Inspired by traditional middle-eastern covered courtyards and wind towers, used to cool structures exposed to the desert sun, the museum's clusters of horizontal and vertical galleries of various sizes are connected by catwalks and planned around a central, covered courtyard, incorporating natural features intended to maximize the energy efficiency of the building. The largest galleries will offer a grand scale for the display of large contemporary art installations. Parts of the building will be four stories tall, with "clusters of block and cone-shaped connected galleries seemingly piled on top of each other." The museum is intended to be a centerpiece in the island's plan for contemporary art and culture". The new museum began construction on a peninsula at the northwestern tip of Saadiyat Island adjacent to Abu Dhabi. Gehry commented, "The site itself, virtually on the water or close to the water on all sides, in a desert landscape with the beautiful sea and the light quality of the place suggested some of the direction." The completion date was pushed back from 2011 to at least 2017. In March 2011, over 130 artists announced a plan to boycott the Abu Dhabi museum, citing reports of abuses of foreign workers, including the arbitrary withholding of wages, unsafe working conditions and failure of companies to pay recruitment fees to laborers. Continued progress awaits the approval of construction applications and contracts by the Tourism Development & Investment Company (TDIC). As of early 2016, no progress had been made on construction, and the Guggenheim Foundation confirmed that "TDIC has not yet awarded a contract." The Guggenheim Helsinki Design Competition in 2014–2015 was the Solomon R. Guggenheim Foundation's first open, international architectural competition. It received 1,715 submissions from 77 countries, a record for a museum design competition. The design chosen for a proposed €130 million Guggenheim museum in Helsinki, Finland, envisions "an indistinct jumble of pavilions faced in charred wood" and glass. The winning design is by Paris-based Moreau Kusunoki Architectes. Critics objected to the dark color of the design's exterior, which contrasts with the surrounding architecture, as well as the shape of the building. Osku Pajamaki, vice chairman of the city's executive board, said: "The symbol of the lighthouse is arrogant in the middle of the historical center ... [like] a Guggenheim museum next to Notre Dame in Paris. People are approaching from the sea, and the first thing that they will see is that the citizens of Helsinki bought their identity from the Guggenheim." The proposed museum was rejected by the Helsinki city council in 2016. The foundation annually lends hundreds of works of art from its collections to other museums and institutions around the world. It also enters into collaborations with partners throughout the world to engage with diverse audiences and to promote cultural discourse. From 2006 to 2011, exhibitions of the foundation's works were seen in more than 80 museums, such as the National Art Museum of China in Beijing during the 2008 Beijing Olympic Games. In 2010, the Solomon R. Guggenheim Foundation and YouTube, in collaboration with Hewlett-Packard and Intel, presented YouTube Play, A Biennial of Creative Video. More than 23,000 videos from 91 countries were submitted in response to an open call for submissions aimed "to discover and showcase the most exceptional talent working in the ever-expanding realm of online video". Foundation curators selected a short list of 125 videos from which a jury, including artists Laurie Anderson and Takashi Murakami and the musical group Animal Collective, picked a playlist of 25 works. These were featured at the YouTube Play event at the Solomon R. Guggenheim Museum in New York on October 21, 2010, during which the videos were projected on the exterior of the museum building and inside the museum's rotunda. The 25 selected works continued on view at the museum until October 24, 2010. The 125 short list videos were on view throughout the fall of 2010 at kiosks at Guggenheim museums in New York, Berlin, Bilbao and Venice. The project's YouTube channel, youtube.com/play, features all of the short list videos, as well as highlights from the event in New York and information about the project. The collaboration was intended to reach wide audiences beyond the museum environment. New York Times art critic Roberta Smith commented: "It is an idea whose time has come. ... In many ways it is simply an old-fashioned open-submission exhibition of the kind that regional museums and art centers around the country have staged for decades – except that it has gone digital." The BMW Guggenheim Lab is an interdisciplinary travelling project that began in 2011. A collaboration between the BMW Group and the foundation, the lab is part urban think tank, part community center, and part gathering space, which explores issues of urban life through public programming and discourse. The program is designed to proactively engage residents from each city that it visits, and participants on the Internet and from around the world, in free programs and experiments, and to address ideas and issues of urban living with particular relevance to each city. The Lab's Advisory Committee of experts nominates each city's lab team, an interdisciplinary group that creates the programming for that location. The lab was expected to visit nine cities for three months each over the course of six years, with three different structures housing the lab, each of which was to travel to three cities. In 2013, however, BMW ended its support of the project. The lab's structure was designed by the Tokyo-based architecture firm Atelier Bow-Wow. The project's three-city cycle was designed around the theme Confronting Comfort, which explored ways of making urban environments more responsive to people's needs, striking a balance between individual and collective comfort, and promoting environmental and social responsibility. The Lab's Advisory Committee members were: Daniel Barenboim, Elizabeth Diller, Nicholas Humphrey, Muchadeyi Masunda, Enrique Peñalosa, Juliet Schor, Rirkrit Tiravanija, and Wang Shi. The lab was open from August 3 to October 16, 2011, in New York City's East Village and was attended by over 54,000 visitors from 60 countries. The Lab was open in Berlin from May 24 to July 29, 2012. The programming of the Berlin Lab focused on four main topics: Empowerment Technologies (Gómez-Márquez), Dynamic Connections (Smith), Urban Micro-Lens (Rose) and the Senseable (SENSEable) City (Ratti). The Lab opened in Mumbai, India, on December 9, 2012, and ran until January 20, 2013. The central location was on the grounds of the Dr. Bhau Daji Lad Museum, with additional satellite locations around the city. Along with neighborhood-specific public programming, the Mumbai Lab program included participatory research studies and design projects. The program ended with an exhibition, Participatory City: 100 Urban Trends from the BMW Guggenheim Lab, which was on view at the New York museum from October 11, 2013, through January 5, 2014. The Guggenheim UBS MAP Global Art Initiative is a five-year program, supported by Swiss bank UBS in which the Foundation identifies and works with artists, curators and educators from Asia, Latin America, the Middle East and North Africa to expand its reach in the international art world. For each of the three phases of the project, the museum invites one curator from the chosen region to the Guggenheim Museum in New York City for a two-year curatorial residency, where he or she works with a team of Guggenheim staff to identify new artworks that reflect the range of talents in their parts of the world. The resident curators organize international touring exhibitions that highlight these artworks and help organize educational activities. The Foundation acquires these artworks for its permanent collection and includes them as the focus of exhibitions that open at the museum in New York and subsequently travel to two other cultural institutions or other venues around the world. The Foundation supplements the exhibitions with a series of public and online programs based on the theme of cross-cultural exchange. UBS is reportedly contributing more than $40 million to the project to pay for its activities and the art acquisitions. Foundation director Richard Armstrong commented: "We are hoping to challenge our Western-centric view of art history." The first exhibition (phase 1) focuses on art from South and Southeast Asia and is curated by Singaporean June Yap, who has worked for six years in the curatorial departments of modern and contemporary art museums, including the Institute of Contemporary Arts Singapore and the Singapore Art Museum. The second and third phases of the project will focus on Latin America and the Middle East and North Africa. The Hong Kong-based Robert H.N. Ho Family Foundation made a $10 million grant to help the New York museum to commission works for its permanent collection by at least three Chinese-born artists and to hire a curator dedicated to its Chinese art collection. The works are expected to be exhibited at the museum in New York in three exhibitions between 2014 and 2017 and also at the other Guggenheim museums. The commissions are part of an effort by the museum to broaden the geographical scope of its collection, and the Robert H.N. Ho Family Foundation hopes that the collaboration will foster "a greater understanding of Chinese culture." List of art museums in the U.S.
^ "Solomon R. Guggenheim Foundation" (PDF). Foundation Center. Retrieved 21 November 2017. ^ a b Warren Hodge (August 8, 1999). "Bilbao's Cinderella Story". The New York Times. Retrieved October 21, 2011. ^ Kaufman, Jason Edward. "Why the Guggenheim won’t open a branch in Guadalajara", The Art Newspaper, Museums, Issue 192, June 1, 2008; "Cancela proyecto la fundación Solomon R. Guggenheim en Guadalajara" [Solomon R. Guggenheim foundation cancels project]. El Informador. Guadalajara, Mexico. 26 October 2009. ^ Carol Lewis (February 28, 2008). "Provocative Guggenheim director resigns". The New York Times. Retrieved October 21, 2011. ^ Carol Vogel (July 9, 2006). "Guggenheim Foundation and Abu Dhabi Plan Museum There". The New York Times. Retrieved October 21, 2011. ^ a b c Carol Vogel (January 18, 2011). "Guggenheim Considers a Museum in Helsinki". The New York Times. Retrieved October 21, 2011. ^ "Saadiyat Cultural District". Guggenheim Foundation. Archived from the original on November 18, 2011. Retrieved October 21, 2011. ^ a b c "Guggenheim Helsinki: Lacking spark". The Economist: 74. 27 June 2015. ^ Ignacio Villarreal. "artdaily.org "Guggenheim Marks Completion of Restoration With First Public Viewing of Work by Artist Jenny Holzer"". Artdaily.com. Retrieved May 8, 2009. ^ "National Register of Historic Places; New Listings October 6–10, 2008 (Building #05000443)". Nps.gov. October 17, 2008. Retrieved May 8, 2009. ^ Aggerwal, Artika. "Frank Owen Gerty". Retrieved August 18, 2011. ^ Cornwell, Rupert (July 10, 2006). "Abu Dhabi named as home of Gehry's new Guggenheim". The Independent. London. Retrieved October 1, 2008. ^ a b "Ando, Gehry, Hadid, and Nouvel". Arcspace.com. February 5, 2007. Archived from the original on December 21, 2008. Retrieved October 1, 2008. ^ Adam, Georgina. "Guggenheim Abu Dhabi on Hold" Archived December 31, 2011, at the Wayback Machine, The Art Newspaper, October 24, 2011. Retrieved April 3, 2012. ^ Nicolai Ouroussoff (March 16, 2011). "Abu Dhabi Guggenheim Faces Protest". The New York Times. Retrieved October 21, 2011. ^ a b "Meet the Architects: Guggenheim Helsinki Design Competition". Guggenheim.org. Archived from the original on July 20, 2015. Retrieved July 16, 2015. ^ a b c Roberta Smith (October 22, 2010). "Home Video Rises to Museum Grade". The New York Times. Retrieved October 21, 2011. ^ a b c "YouTube Play". Guggenheim Foundation. Retrieved October 21, 2011. ^ Emanuella Grinberg (October 23, 2010). "Top 25 videos make up 'ultimate YouTube playlist.'". CNN. CNN. Retrieved October 21, 2011. ^ Sharon McHugh (May 17, 2011). "BMW Guggenheim Lab to Launch in NYC". World Architecture News. WorldArchitectureNews.com. Retrieved January 23, 2012. ^ a b c "BMW Guggenheim Lab to Launch in New York City on August 3 Before Traveling to Berlin and Asia" (Press release). Guggenheim Foundation. May 6, 2011. Archived from the original on January 25, 2012. Retrieved January 23, 2012. ^ a b c d Carol Vogel (October 27, 2011). "Urban Lab Heads East". The New York Times. Retrieved January 23, 2012. ^ "BMW Guggenheim Lab Berlin to Open in May 2012". Dexigner. November 9, 2011. Retrieved January 23, 2012. Stoller, Ezra and Jeff Goldberg (1999). Guggenheim Bilbao. New Jersey: Princeton Architectural Press. Wikimedia Commons has media related to Guggenheim.